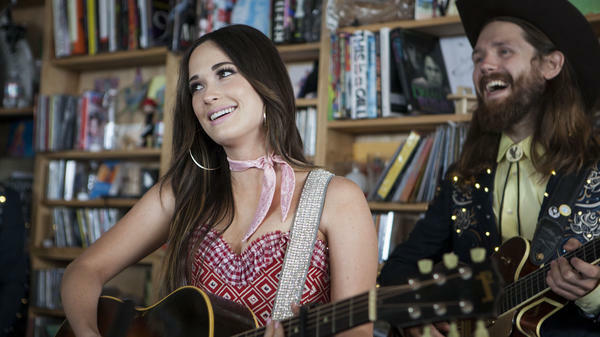 Kacey Musgraves made a point of showcasing her gentler side during her 2015 Tiny Desk Concert, but as it so often does, rowdiness prevailed in the end. While accepting the Best Contemporary Blues Album Grammy for Please Don't Be Dead, Fantastic Negrito gave a shout-out to the Tiny Desk concerts series, which he said changed the course of his life and offered hope when he'd almost given up. As we approach 11 years and more than 800 concerts behind my desk, all of us at NPR Music feel proud of championing the artists we're passionate about, including Kacey Musgraves, Anderson .Paak, Brandi Carlile, Leon Bridges, Punch Brothers, St. Vincent and, of course, Fantastic Negrito. We're thrilled that this crop of talent will be recognized by an even larger audience. Congratulations to the night's winners! • Best Rap Performance, "Bubblin"
• Best American Roots Song, "The Joke"
• Best American Roots Performance, "The Joke"
• Best R&B Album, H.E.R. • Best Country Song, "Space Cowboy"
• Best Country Solo Performance, "Butterflies"
• Best Traditional R&B Performance, "Bet Ain't Worth the Hand"
• Best Traditional R&B Performance, "How Deep Is Your Love"
• Best Rock Song, "Masseduction"
• Best Instrumental Composition, "Blut Und Boden (Blood And Soil)"